What is the Pipplet test? 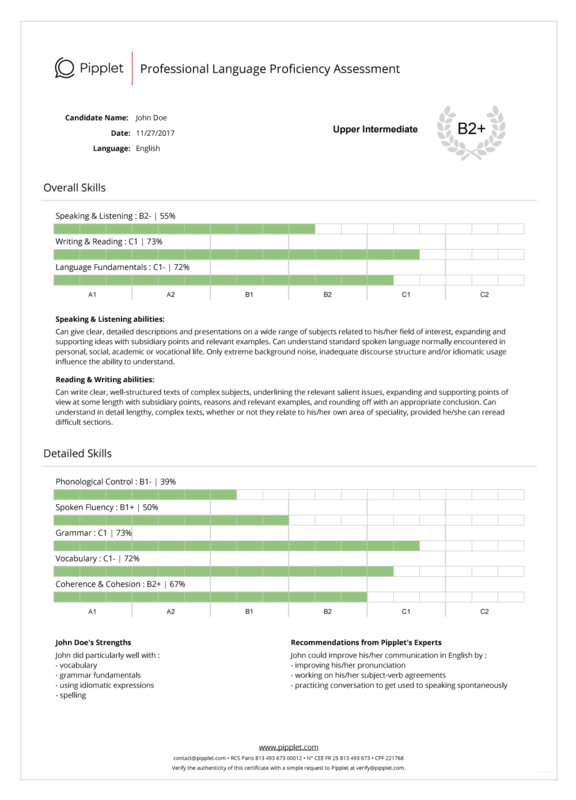 Pipplet is an online language evaluation service. It evaluates your professional language skills, both oral and written. The test, via your computer, will present you with scenario-based questions. The test lasts about thirty minutes. Some of the test’s questions will require you to answer by speaking out loud. The remaining questions will require you to type using your keyboard (make sure that your keyboard allows you to successfully write in the letters and:or characters necessary in the given language). All of the questions are timed and presented in an open-response format (no multiple-choice). What should I prepare before taking the Pipplet exam? A computer with the latest update of either Chrome or Firefox. Ideally, a headset equipped with a functioning microphone or a computer equipped with a functioning microphone and loudspeakers. We recommend spending time practicing speaking and writing in the given language before taking the test, especially if you have not used the language recently. This way, you can take the test comfortably and take full advantage of the allotted test-taking time. How should I answer the Pipplet test questions? Pipplet differs from typical multiple-choice tests. The test’s questions are presented in an open-response format, meaning the questions will allow you to respond freely, both orally and in writing. Your responses will then be evaluated by expert language teachers. Plan out your oral responses before recording in order to better achieve responses that are fluid and well-structured. Respond in as much detail as possible. The more developed your responses, the better the evaluator will have an understanding of your language skills. Structure your responses well. The coherence of your answers will be taken into consideration as part of the evaluation. Re-read before moving on to the next question. Keeping in mind that each question is timed, we recommend saving the final thirty seconds to read over your response. You will be evaluated by native-speaking language teachers, according to the language administered by the test. Your responses will be saved at the end of the test and sent to a member of the said team of evaluators. The evaluator will listen to and read your responses and evaluate them according to the Common European Framework of Reference for Languages (CEFR). Your results will be provided to the enterprise that prompted you to take the test. The results are sent via email in the format of the example certificate shown below, according to the CEFR. Your certificate explains, in detail, your oral and written language competences. Once the given enterprise receives your test results, their decision to share the results with you remains at their discretion. If you receive your individual test results, put them to good use and integrate them in the European Language Passport! Use the link provided below to take a practice test! The practice test will allow you to become familiarized with the test interface, but your responses will not be evaluated as part of the test you are prompted to take. If you were asked to take the test as part of a recruitment, use this practice test. If you were asked to take the test as part of a training, use this practice test.